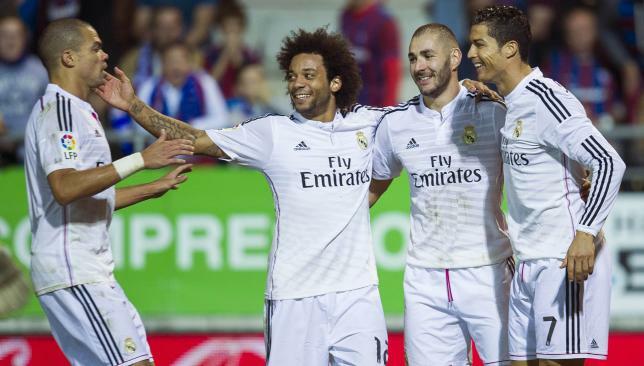 Fine form: Cristiano Ronaldo netted a brace as Real Madrid marched on. Real Madrid saw off Basque minnows Eibar's dreams of a giant-killing thanks to a Cristiano Ronaldo double to register their 14th consecutive win in all competitions with a 4-0 victory on Saturday. The European champions had more than a touch of fortune in the first half as James Rodriguez headed home the opener despite Ronaldo and Karim Benzema appearing to be in an offside position in the build-up to the goal. Ronaldo then doubled the lead himself with a mishit shot that looped beyond Xabi Irureta just before the break. Benzema smashed home the third 20 minutes from time before Ronaldo rounded off the scoring from the penalty spot. Lionel Messi scored his first hat trick of the season and made history as he fired Barcelona to a resounding 5-1 win at home to Sevilla. The Argentine's treble took him past former Athletic Bilbao forward Telmo Zarra's mark of 251 goals and on to 253. They have come in just 289 games. The 27-year-old opened the scoring with a sensational free-kick to draw level with Zarra, but his strike was cancelled out by Jordi Alba's own goal at the start of the second half. Neymar headed Barca back in front moments later and Ivan Rakitic extended Barca's lead before Messi broke the scoring record after an awesome combination with Neymar and then struck again to complete his treble. La Liga champions Atletico Madrid had earlier in the day temporarily moved into second place in the tablewith a 3-1 win over 10-man Malaga. Earlier, Atletico Madrid bounced back from their surprise defeat to Real Sociedad before the international break with a 3-1 win over Malaga. The hosts looked on course for a comfortable victory as Tiago nodded them into an early lead from Koke's corner before Antoine Griezmann tapped home at the end of a flowing move to double the lead just before half-time. Roque Santa Cruz briefly gave the visitors, who had won their previous five La Liga games, hope when he volleyed home Samu Castillejo's wonderful cross 26 minutes from time, but their chances of a point dissipated when Samuel Sanchez was shown a second yellow card just nine minutes later. Diego Godin wrapped up the three points as he powered home a header from close range seven minutes from time, but Atletico also ended the game with 10 men as captain Gabi picked up his second booking of the afternoon in the closing stages. 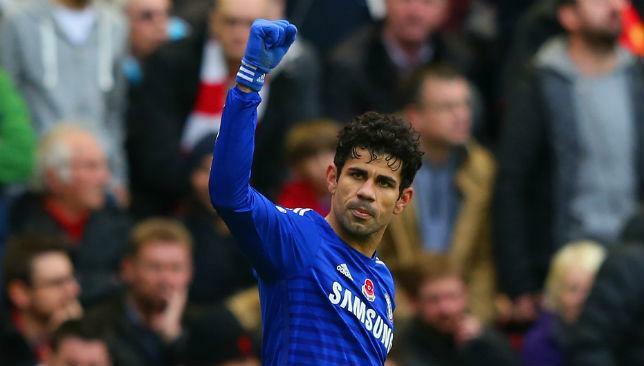 Diego Costa struck his 11th goal in 10 Premier League games as leaders Chelsea won 2-0 at Stamford Bridge. Diego Costa struck his 11th goal in 10 Premier League games as leaders Chelsea cruised to a comfortable 2-0 home win over 10-man West Bromwich Albion on Saturday. Costa put the hosts on course for victory in the 11th minute and Eden Hazard added a second in the 25th minute, shortly before Claudio Yacob was dismissed for an ugly, two-footed lunge on Costa. The one-sided win extended Jose Mourinho's side's lead at the head of the table to seven points, 48 hours before second-place Southampton travel to Aston Villa. Leon Osman ensured his 400th Everton appearance was one to savour as he scored the decisive goal in their 2-1 Premier League victory over West Ham United. Belgium striker Romelu Lukaku had put the Toffees ahead in the first half before Mauro Zarate equalised for the Hammers 11 minutes into the second period. But 33-year-old midfielder Osman helped Roberto Martinez's side collect all three points when he finished off an Everton counter-attack from close range in the 73rd minute. Newcastle climbed to fourth in the Premier League after Moussa Sissoko's second half strike clinched a 1-0 win over QPR. Sissoko's goal 12 minutes from time at St James' Park was enough to give Alan Pardew's revitalised side their sixth successive win just weeks after they looked destined for another season of struggle. Pardew's men have not conceded a goal in 432 minutes and will be starting to dream of securing a place in European competition next season. Manchester City midfielder Yaya Toure emerged from his recent slump to score a superb solo goal that gave the Premier League champions a much-needed 2-1 victory over Swansea at Eastlands. The result ends a run of just one victory in their previous six games for City, who now move on to a crucial Champions League group game against Bayern Munich on Tuesday, a match for which Toure is suspended following his dismissal in City's last European game against CSKA Moscow. Leicester City failed to score for the fifth straight match as they were held 0-0 by Sunderland in a bottom-of-the-table Premier League clash at the King Power Stadium. However Nigel Pearson's team dragged themselves one place clear of the bottom three on goal difference, ahead of Burnley who triumphed 2-1 at Stoke. 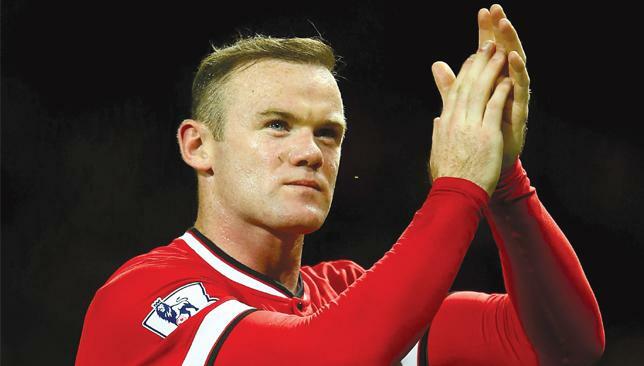 Time to be the main man: Should Wayne Rooney be United’s first-choice striker? Arsenal welcome Manchester United to the Emirates with both heavyweights of the English game lying outside the top four of the Premier League. Andy Gray and Richard Keys, who front beIN Sports’ EPL coverage, offer their views on the clash as well as the weekend’s other fixtures. Andy Gray: It’s strange to think this game, which traditionally has been a match potentially deciding the destiny of the title, is now a contest for the top four. But that’s not to say there won’t be any spice in the game as there are a number of subplots: Robin van Persie going back to Arsenal, Danny Welbeck up against the team that sold him in the summer and Wayne Rooney coming off the back of his two goals against Scot­land. There’s also the fact that with West Ham and Swansea having tricky away games, a win for either one can see them leapfrog those sides and into the top four. That would be a huge boost. It certainly won’t be 0-0 as both of them are poor at the back and I can’t see them keeping a clean sheet. But Louis van Gaal has a number of selection issues which could be key. Does he, after his two goals against Scotland, play Wayne Rooney as the No9 or does he con­tinue with Robin van Persie there? Personally, I’ve always thought Rooney’s best position is as a strik­er. He enjoyed his best goalscoring season there in that position in 2011/12 and, like we saw with Eng­land, he could cause Arsenal some serious problems. However, I’m edging towards Arsenal simply be­cause they’re at home and in these big games the host doesn’t tend to lose. United also haven’t won away all season in the league. 3-2. Richard Keys: I do think of the two, it’s more likely Arsenal will finish in the top four this season. At their best they’re better than United. They understand what’s re­quired, they’re more of an experi­enced unit and Manchester United just aren’t that at the moment. They’re still a collection of bits and pieces and their defence is an Achilles heel that will allow teams, in contests that matter, to get at them. I don’t see any signs of improve­ment, far from it, I think they’re worse than they were last year. I know Van Gaal’s been moaning about international injuries but most injuries have been inflicted on the training ground during the course of his double sessions. I think they’ll go for some defenders in January. I know Ed Woodward said they won’t spend any money but they won’t have to get Ron Vlaar. I was toying with 3-3 as they’re both awful defensive­ly but United are worse, 2-1. AG: Chelsea haven’t been great at home, in fact in some games they’ve been pretty ordinary, but they keep churning out the results and I can see this one going the same way. West Brom are doing well under Alan Irvine but I just think Chelsea will have too much for them and it’ll be 2-0. RK: West Brom have been dif­ficult opposition for them down the years but Chelsea haven’t had as many players on international duty as they usually would and I’m sure Cesc Fabregas and Diego Costa will play. You just don’t know what you’re going to get with West Brom. They’ll put in a really good performance one week, and the next they just look awful. 2-0. AG: Hopefully, for City, the Cham­pions League won’t prove too much of a distraction as they have the big game on Tuesday. Will he rest any­one? I don’t think so, and for that reason they’ll beat Swansea. Manuel Pellegrini knows they can’t afford too many more slip-ups in the league and he simply has to start Sergio Aguero. 3-1. RK: Swansea have the joint second-best defensive record in the league and I don’t think they’ll be inhibited by going to the Etihad. City aren’t winning enough games. Full stop. I think they’ve prioritised Champions League and have come unstuck because that hasn’t worked out the way they wanted. If Pellegrini doesn’t have some kind of success this season I think he’s toast. 1-1. AG: Losing Daniel Sturridge is a huge blow. Not just for Liverpool but for him as well and Brendan Rodgers now has to cope without his best striker for another long pe­riod. It’s strange Liverpool allowed Divovk Origi, a Belgian interna­tional, to be loaned out for a whole season. Brendan Rodgers obviously thought they’d be okay in that area of the field but now look at them. I think this game is tailor-made for Rickie Lambert. He’ll give them a focal point in attack. 0-2. RK: Crystanbul revisited. Palace have one point from 15 but this might just be the sort of game they need to get going. I see Rodgers saying he may give Fabio Borini and Lambert a run, is he telling us that he’s lost patience with Mario Balotelli? Liverpool are nowhere near the team that challenged last season, and that includes every­body in the squad. I don’t think they’ll make top four. 2-1. AG: I fear for my old team Villa, I really do. They’ll undoubtedly receive offers for Ron Vlaar, Fabian Delph and Christian Benteke in January and the chances are all three of them could go. Going for­ward they have a dreadful record with just five goals all season and it’s very difficult to see just how they can beat a Southampton side playing so well. 0-2. RK: Every week I say, “Saints can’t keep winning”, and they do. Villa away is always a nice fixture, espe­cially if you’re playing well. There’s really no reason at all why South­ampton can’t go there and win. 1-2. AG: Sam Allardyce will fancy get­ting a result but West Ham look to be without Diafra Sakho and Stewart Downing which could just throw them off their stride a little. They don’t have a great record at Goodison Park, and sometimes you can get a psychological block against certain teams. 1-0. AG: Who knows with Tottenham? It’s difficult to see what kind of a side they are under Mauricio Pochettino, which makes them tough team to call. Likewise Hull have plenty of ability but then don’t always produce the results they perhaps should. With that in mind I’m going 1-1. RK: Hull need a result badly. If this was at White Hart Lane I’d go with Tottenham but at their own place, with players who will want to per­form against Spurs, they can keep them quiet for long enough. 1-0. AG: Even at the start of the season when they were losing all those games I didn’t Newcastle were that far off being a good time. They were very much in games and were just missing something. Now they’ve found a goalscorer in Ayoze Perez they look a much better team and they’ll be too strong for QPR. 3-1. AG: Leicester just cannot keep losing and you’d think if there was one game where they’d stop the rot it’d be this one. Sunderland have had some good results of late and if there’s a winner in this game I’ll go with them but, because it’s at the King Power Stadium, I’ll go 1-1. AG: Don’t expect a classic and Burnley will surely give Stoke a tough time but Mark Hughes has the Potters playing better now. 2-0. RK: I’m going for a Stoke win, sim­ply because they’re at home, eve­rybody’s been talking about Bojan and Burnley, who aren’t a Premier League outfit, don’t have enough to stop them playing. 2-0.